: Off with their heads! I was at Carolina Auto Masters last month, and my Cougar dynoed a mere 260HP. On the second run, it puked copious ammounts of fluids on the car and some of the Tar Heel SCC members. Yuk. So I drove it 40 miles home after filling the radiator and parked it. Scott was between cars and he did an initial test using a condom on the radiator kneck instead of the cap. The condom filled up seconds after starting the car. He pressurized the cooling system, and coolant squirted out of cylinders #2 and #6. I got a look at the Dip Stick and there was the tell tale sign of coolant in the oil: icky white stuff. Usualy it's more brownish, but I just changed my oil and it didn't get a chance to get fully mixed. So I marked the wires and started pulling the headers off. Scott got his hands dirty too and did a lions share on the tough looking engine. We got the manifold off and everything looks normal except for the occasional globs of oil/coolant mayonaise. I built a hideously expensive pushrod organizer andpopulated it with pushrods and rockers. Now I could check the torque on the head bolts. 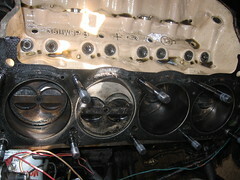 Almost all gasket makers claim that you do not have to retorque the heads, but don't you believe it. My heads are aluminum, and the lower bolts were touching the headers. The bolts should have been at 85 ft/lbs and because of static friction, a torque wrench should not be able to budge the bolts 'till 90lbs or so. The upper bolts seemed fine to 80 ft/lbs but all the lower bolts moved between 50 and 60 ft/lbs. Damnit. So off with their heads! Even with studs the heads were easily removed inside the car. I haven't done this job with a 351W in a Mustang since 1985 and I got all weepy and nostalgic, even though this time it was a Cougar. You can see that with the high compression and the loosening heads the fire ring was stretched into the water jaket leading to loss of compression and that ugly milk shake mayo mess. Exactly the same thing happened on the other side. Well, I need to mull this over for a bit. The camshaft I have is a bit too lumpy so I'm going to select another one since this is a great time for it. I have 11:1 compression, so it needs to be pretty radical to bleed off the excess cyllinder pressure, but milder than my current 232/232@.050 specs. There are t-storms comming, so I coated the cylinders with lube and wrapped it up.